Located to the east around the mainland coast from Phuket's Sarasin bridge, at the south end of Phang Nga Bay, one of the most spectacular bays in Thailand, the tropical paradise of Krabi is the springboard for the beautiful mainland beaches and dramatic coastline cliffs of Laem Phra Nang, Koh Lanta and the ever popular Koh Phi Phi Islands. Krabi Town is the provincial centre and is a beautiful spot, strung out along the west bank of the Krabi estuary, with mangrove-lined shorelines to the east, a harbour filled with traditional old fishing vessels and looming limestone outcrops in all directions. If it's stunning scenery and countless adventure options that you're after, minus the crowds of Phuket or Phi Phi Island, Krabi is the place for you. 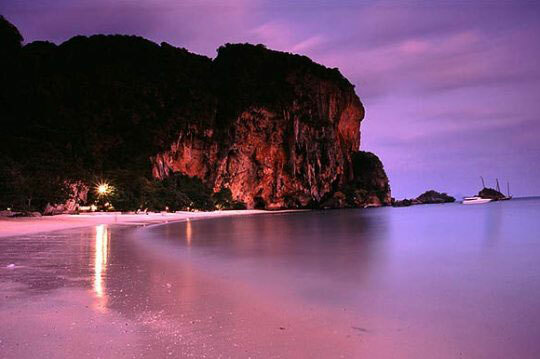 Krabi is the adjacent province to Phuket, in southern Thailand. 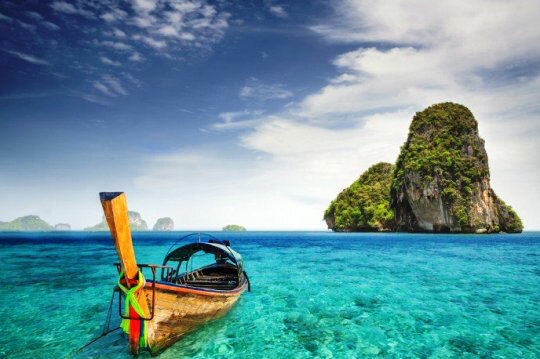 Both Thai Airways ) and Bangkok Airways run at least 2 daily flights between Bangkok and Krabi, while Andaman Air flies between Phuket and Krabi 3 times daily. The tiny airport of Krabi is approximately 18 kilometres east of Krabi Town and Thai Airways run a shuttle bus for only US$ 3 (in Thai Baht), though if they are fully booked or if you prefer more comfort, you can get a taxi into town for only US$ 16. Direct air-conditioned and VIP buses leave Bangkok's southern terminal between 18:30 hrs and 20:30 hrs every day, or you can catch the train from Bangkok to Surat Thani and then pick up a bus to Krabi, though there is little to be gained in comfort or speed. 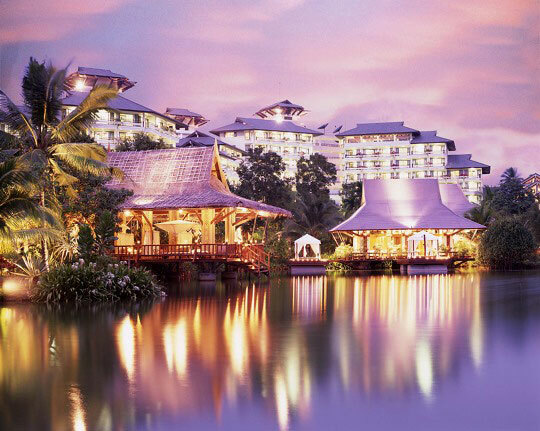 Take your pick from dozens of options, from top-of-the-range international beach resorts to budget hotels and inns. There's something to suit everyone's taste and pocket. And you can be sure that whatever options you select, it will be backed up with their 'Low Price Guarantee' to ensure you get top-dollar value for money. The combination of sheer limestone cliffs, pure white sand and clear tropical waters of Laem Phra Nang is simply irresistible. 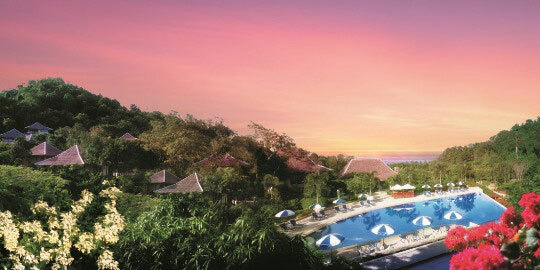 There is no shortage here of bungalows set amongst coconut palms or in beautifully landscaped gardens. 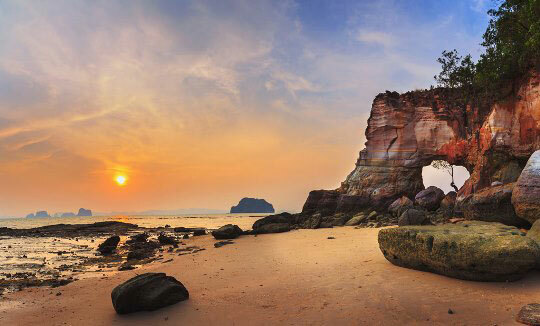 The headland has 3 beaches within a short walk of each other: Ao Phra Nang is on the south western edge and is flanked on either side by East and West Railay Beach. Set against a backdrop of cliffs and palm trees, the tiny Ao Phra Nang attracts sun worshippers to its glorious soft sand and snorkellers to the coral reefs only 200 metres off shore. Named after a princess (Phra Nang means 'revered lady'), the beach can be only be reached via East Railay and is served by relaxed beach front cáfes and bars. West Railay, sometimes known as Sunset Beach, has similarly impressive scenery and crystal waters, but has a much longer stretch of sand. For more seclusion, walk a few hundred metres beyond the longtails that serve the beach to another lovely uncrowded beach around the headland. The beach of East Railay is not really suitable for swimming due to fairly strong mangrove growth and a tidal movement, though there is a proliferation of inexpensive bungalows here that are no more than 10 minutes walk from West Railay and Ao Phra Nang. Laem Phra Nang is only accessible by boat from Krabi Town or Ao Nang Beach departing from various points along the Krabi riverfront, leaving the pier as they fill up. 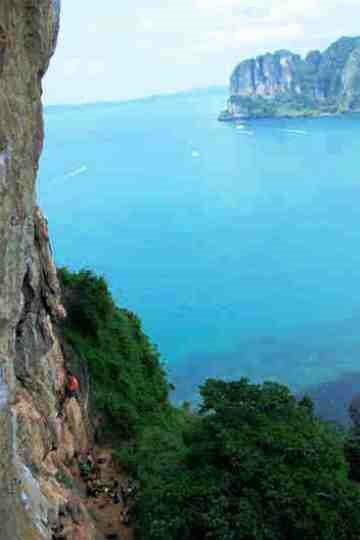 Given the surrounding landscape, there's a huge potential for rock climbing, absailing and caving at Laem Phra Nang with some 300 bolted sport-climbing routes on the cape of varying difficulty for those seeking an extra adrenalin rush. There are various climbing out-fitters where you can rent equipment, guides and instructors. The limestone cliffs and mangroves in this area also make fantastic locations for kayaking, and there are several operations at both East and West Railay that rent out kayaks by the hour, half-day or full-day. Ao Nang, sometimes signed Ao Phra Nang, is slightly further north up the bay and is blossoming into quite a lively resort. Though the beaches are not quite as fine, it can be quieter and more private than Laem Phra Nang. For even more peace you can wade around the small headland at the southern tip of the beach and find yourself on another long beach of fine golden sand. Ao Nang has advantages over Laem Phra Nang in that it has more developed tourist facilities and has easier access to other tourist destinations around the Krabi area. It can also be reached by road from Krabi Town, with songthaews running approximately every 45 minutes. However, if you take a longtail from either Krabi Town or Laem Phra Nang you will get the full scenic exposure to the crystal waters and the limestone monoliths that are nothing but awesome. Continuing north from Ao Nang brings you to the eastern end of the invariably deserted 2 kilometre stretch of beach that is Hat Nopparat Thara. The beach is part of the Mu Koh Phi Phi Marine Park that encompasses Koh Phi Phi, and though it is not really possible to swim here at low tide, the beach is alive with huge numbers of starfish and hermit crabs. You can also easily walk out and snorkel at the small offshore islands here. 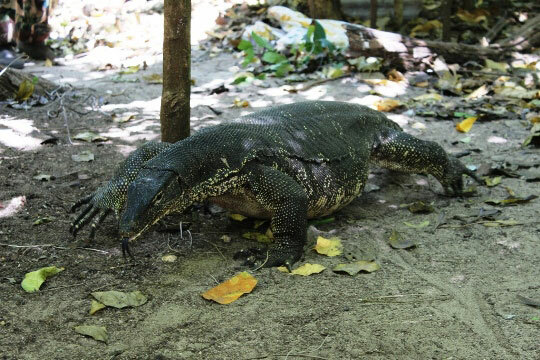 This is a great place to escape from the areas' busier beaches. The views of the karst islands are amazing, enhanced by the fact that you can walk out and explore some of the closer ones at low tide. 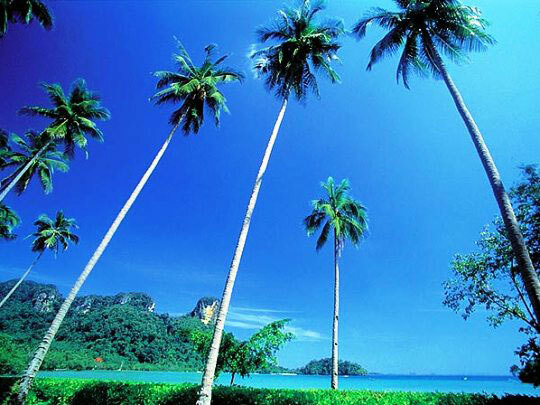 Krabi's climate is tropical and warm throughout the year. The northeast monsoon from November into March is wonderful, with breezy clear days and fragrant cool nights. 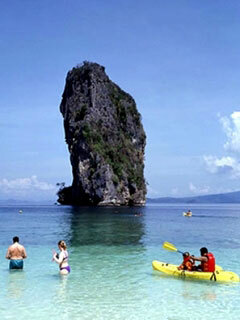 From November to April, Krabi has an average 26 sunny days per month. The southwest monsoon, from May to October, brings rain and winds to the west coast of southern Thailand, but there are still 20 sunny days per month. Most often it's only a cool, late afternoon shower, but there can be rainy days here. Seas can be quite rough during this season and swimmers should be careful. 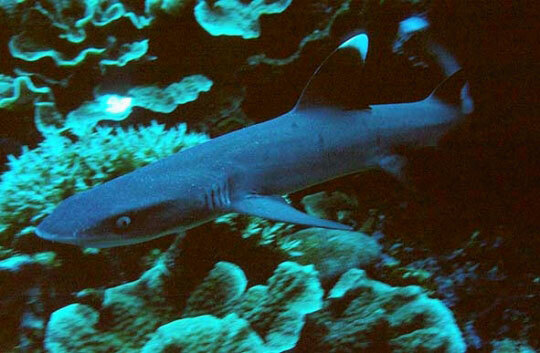 Ao Nang diving trips can be cancelled due to bad weather at this time of year. There are 2 very hot periods of weather in Krabi, the first between April and May when the average temperatures range from 30 to 36°C and only the occasional tropical thunderstorm brings relief from the heat. It is also very hot between September and October but the frequent rainfall has a wonderful cooling effect. Tourist High Season is from November to April. 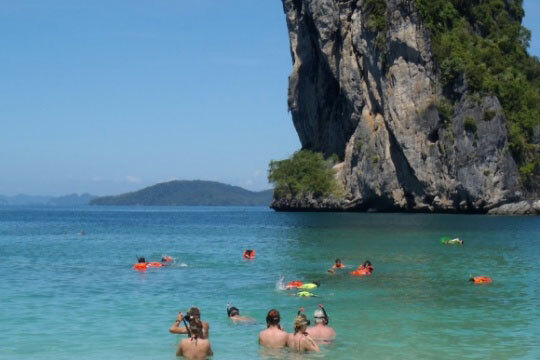 However, it's best to avoid December and January and in particular Christmas and New Year if possible, as this is Peak Season, when accommodation can be hard to find and is expensive, and Krabi's dive sites are very crowded. 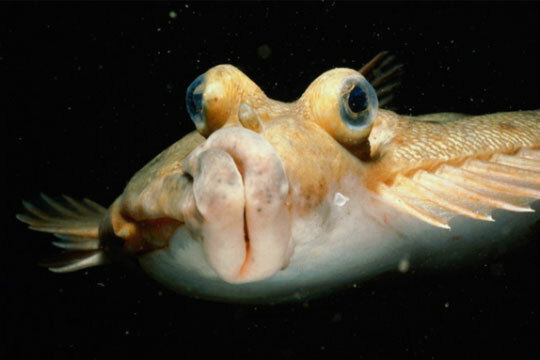 Whether you are coming to Thailand on a diving holiday or not, we recommend you try to come from February to April. There are less tourists here, accommodation is much better value-for-money, the weather is at its best, and the seas their calmest. The dive sites around Ao Nang and Krabi are less crowded, and its your optimum time to see something special, as it's manta ray and whale shark season. If you tire of the beach life, there are many exciting alternatives around Krabi. 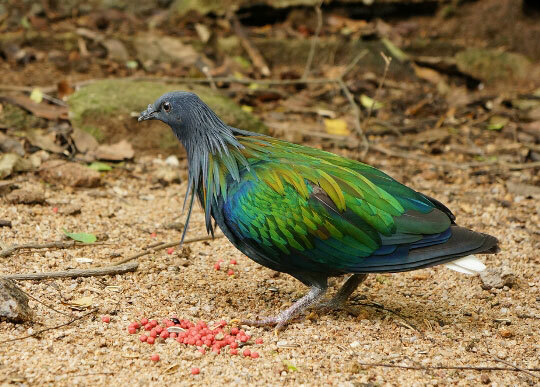 Take one of the tours (sold by most tour agents) of local islands and coral reefs in the bay area or, if you prefer to keep your feet on land for a few days, you can hike through the national park near Klong Thom, home of the rare Gurney's Pitta. There are also several ways to see the local mangrove swamps along the Krabi River. You can join a tour operator, or organise by yourself with one of the boat men that can be found around the 2 piers. 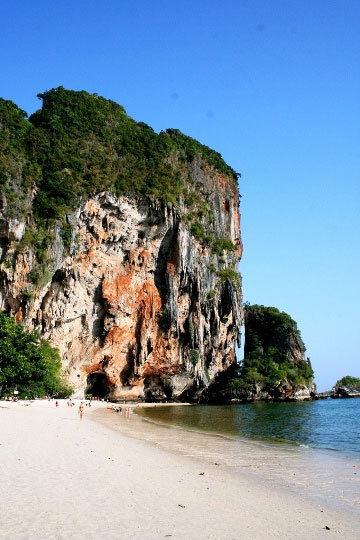 The most famous part of the tour will inevitably be the twin limestone outcrops known as Khao Kanab Nam which rise majestically 100 metres above the water line and have now become the symbol of Krabi. You can also choose to kayak around the swamps allowing you the luxury of more time to explore things at your own pace. 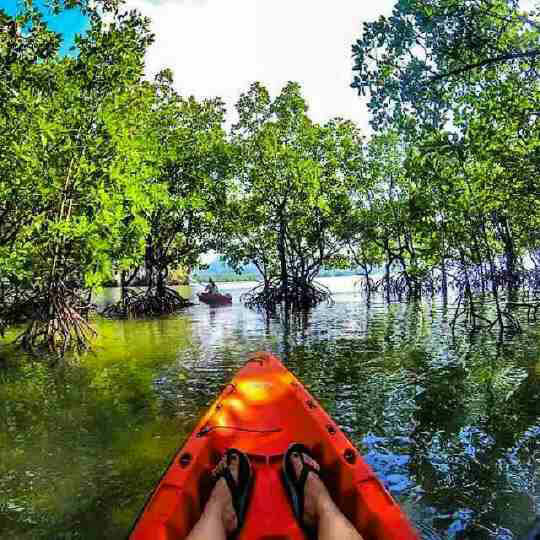 Far from limiting yourself to the mangroves however, why not try sea kayaking. 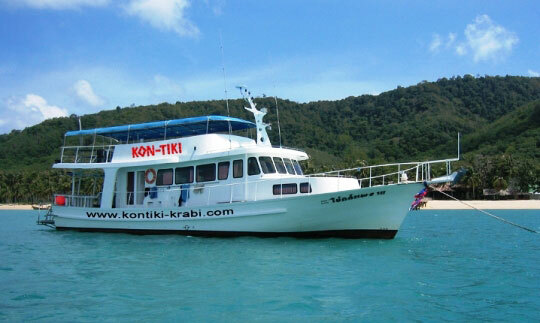 This is possibly the very best way to see the Krabi coast. 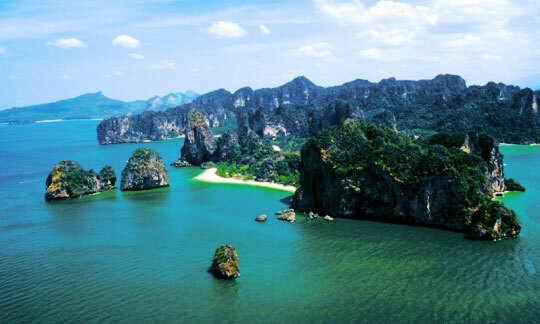 The most impressive of these trips will take you to Koh Hong. This tidal lagoon can only be accessed by small boats and kayaks at certain times and the 360° sheer cliff faces are festooned with vegetation and enlivened by populations of monkeys and flying foxes that have remain undisturbed here for hundreds of years. An action packed adventure awaits if you take cycling tour around Krabi. Escape the crowds, discover the real Thailand and do it all on 2 wheels. 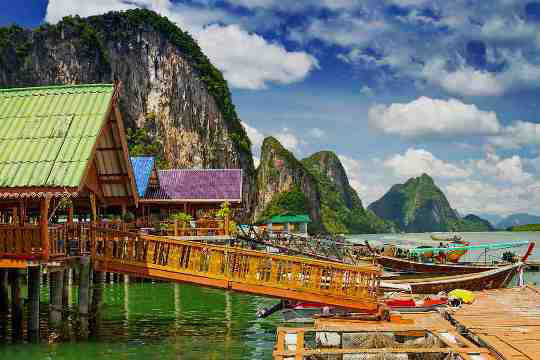 Finally, why not take to the sea again and visit Khao Ping Gan, better known as James Bond Island and made famous in the film The Man With The Golden Gun, and Koh Panyee, a traditional floating fishing village. Krabi Town comes alive after the sun goes down and more and more nightspots are springing up. Euro style bars and cáfes, night clubs and the standard Thai karaoke bars give the town a great atmosphere. Take a stroll around the town and you will find a few places that you can stop for a drink or a dance. Krabi also has plentiful tourist-orientated restaurants, but for a truly inexpensive traditional Thai meal, head for the riverside night market which sets up around the pier head at 18:00 hrs every evening. The province has perhaps the country's oldest history of continued settlement. After dating stone tools, ancient coloured pictures, beads, pottery and skeletal remains found in the province's many cliffs and caves, it is thought that Krabi has been home to homosapiens since the period 25,000-35,000 B.C. 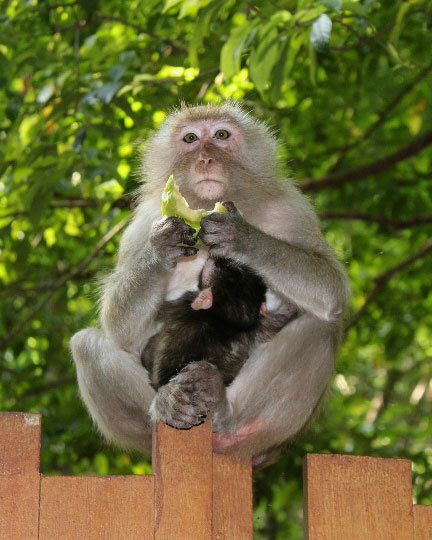 In recorded times it was called the 'Ban Thai Samor', and was 1 of 12 towns that used, before people were widely literate, the monkey for their standard. At that time, circa 1200 A.D., Krabi was a tributary to the Kingdom of Liger, a city on the Era Peninsula's east coast, better known today as Nakorn Sri Thammarat. At the start of the Rattanakosin period, about 200 years ago, when the capital was finally settled at Bangkok, an elephant kraal was established in Krabi Town by order of Jan Prays Nalcorn (Noi), the Rajah of Nakorn Sri Thammarat, which was by then a part of the Thai Kingdom. He sent his vizier, the Phra Palad to oversee this task, which was to ensure a regular supply of elephants for the larger town. So many emigrated in the steps of the Phra Palad that soon Krabi Town had a large community in 3 different boroughs: Pakasai, Kiong Pon, and Pak Lao. In 1872, King Chulalongkorn graciously elevated these boroughs to town status, called Krabi, a word that preserves in its meaning the monkey symbolism of the old standard. The town's first governor was Luang Thep Sena, as it continued for a while as a dependency of Nakorn Sri Thammarat. This was changed in 1875, when Krabi was raised to a 4th level town in the old system of Thai government. Administrators then reported directly to the central government in Bangkok, and Krabi's history as a unique entity, separate from the other provinces, had begun. During the present reign, the corps of civil servants, merchants, and the general population of the province have together organised construction of a royal residence at Laem Hang Nak for presentation to Her Majesty the Queen (as if she needed another one!). This lies 30 km to the west of Krabi Town on the Andaman Sea coast. Local transport in the area comes in many forms - rented mountain bikes, motorbike taxis, rented cars, jeeps etc. to modern air-conditioned limousines. The local bus system (songthaews) will take you to the local towns and a few tourist attractions. They are a very cheap form of transport and pick up almost anywhere in the Krabi area and along the beaches served by road. They generally take the form of converted pick-up trucks with seating and overhead protection from the sun and rain. There is no real timetable for the buses, but they run often and every day of the week. Motorbikes are mostly of the small 100cc and can be driven on international driving licenses. If you have some experience of riding a small motorbike then these are an ideal, inexpensive method of transportation allowing you the freedom to explore the local attractions when and where you wish. A full tank of fuel costs approximately US$ 3 and would give you about 150 kilometres of range. Locally, there is a fleet of longtail boats and these make up the backbone of the sea transport system to and from the many beaches and islands. They can take up to about 10 people and are on standby all day, generally running from 07:30 hrs to 17:30 hrs every day of the week. Just go to the beach and you'll be asked where you want to go. You can also hire a longtail boat for your own exclusive use. 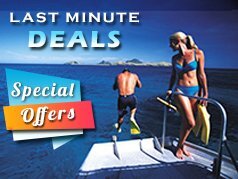 Pricing varies on time and destination but all day hire is around US$ 47 or, for example, you could go to Koh Poda (Poda Island) for an afternoon's snorkelling, or to walk along an almost deserted tropical beach of your choice. For longer sea journeys you can use the local ferries that run to and from all major locations: Krabi Town, Ao Phra Nang Beach, Koh Phi Phi, Koh Lanta, Phuket etc.